Ifeoluwa Shoola spent her summer working with Nigerian children on innovation. Image Credit: Evan Henderson. Ifeoluwa Shoola spent her summer working with Nigerian children on innovation. Photography: Evan Henderson. Ifeoluwa Shoola is inspiring the next generation of innovators. “[If you] think innovatively and think creatively you’re going to make a difference in the world,” she said. 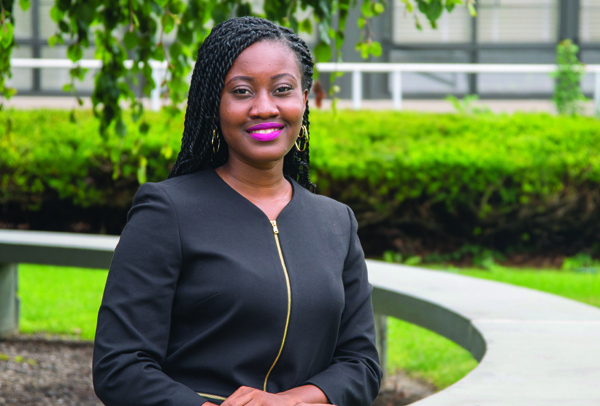 Shoola, a senior majoring in integrative neuroscience and minoring in Africana studies, returned to her home country of Nigeria this summer for her Harpur Fellows project, creating the Ogbomosho Innovation Challenge. The Harpur Fellows program, made possible by the support of Harpur alumni, provides students with the means to pursue a summer project that is not possible through an on-campus academic program. The other 2018 Harpur Fellows are Ramya Gopalakrishnan, Georgia Kerkezis and Tiara Roy. Shoola grew up in Ibadan city, the capital of Oyo State, Nigeria, and went to Bowen University in Iwo, Nigeria, before transferring to Binghamton University. Over her last three years at Binghamton, Shoola found friends and resources that motivated her to make a change. After reading the Harpur Fellows features on the wall near Jazzman’s cafe, Shoola decided to conceptualize her own project. Aiming to give back to her community, she reached out to a few contacts in Nigeria. She decided to team up with Children that Change the World (CTCTW), a radio station that aims to teach underserved Nigerian children new critical and creative thinking techniques. They exchanged ideas and ultimately created the Ogbomosho Innovation Challenge. “We told [the participants]: ‘Think of a problem in your local community and come up with a solution that’s creative and original,’” Shoola explained. Before Shoola applied for her grant, she spoke to several Harpur Fellows who previously completed projects in Africa: Mmekom Udosen, who led a female empowerment workshop in Uyo, Nigeria; Rachel Lubinga, who did work on feminine hygiene in Kampala, Uganda; and Emma Ryan, who worked on internet accessibility in Worawora, Ghana. After Shoola was chosen as a Harpur Fellow and given a grant of $4,000, she sprang into action. Working with CTCTW, she sent flyers with information on the competition to schools and to the city of Ogbomosho, advertised it on the radio and shared the competition on social media. Though Shoola was working with a team, she quickly realized that this project was bigger than anyone could have anticipated. Organizing her project was difficult at times, but Shoola had the resources and the drive to persevere. The support from parents and students in Ogbomosho was also motivating. The competition incentivized collaboration and divergent thinking, leading to unique community outreach projects. Shoola and her team helped students tailor their projects, teaching them an array of skills from PowerPoint to problem-solving techniques. Participants presented their projects and went through two rounds of judging before three winners were chosen. The top three projects received prizes, but everyone received a participation certificate. Shoola’s dedication and excitement was reflected by the participants. The competition may have ended, but Shoola’s impact is still present. They’re currently planning a second innovation competition in Ogbomosho at Ladoke Akintola University of Technology. Working at Binghamton University with REACH, the High Hopes Helpline and the Dean’s Team, Shoola has also left her mark on campus. Shoola put the same quote on her shirts for the Ogbomosho Innovation Challenge. She sent a picture to Jennifer Keegin, who ran the Dean’s Team. Keegan replied and thanked Shoola, saying she was almost in tears.